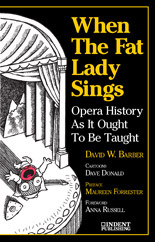 With When the Fat Lady Sings, David W. Barber turns his attention to what Dr. Johnson called that “exotick and irrational entertainment,” the world of opera. Here are stories of love and lust, jealousy, intrigue, murder and tragic death – and that’s just the stuff happening off stage, in the composers’ personal lives. Wait till you read about the opera plots. Informal yet informative, witty yet wise, this book will both enlighten and entertain you. Dave Donald’s delightful and clever cartoons perfectly complement the text.